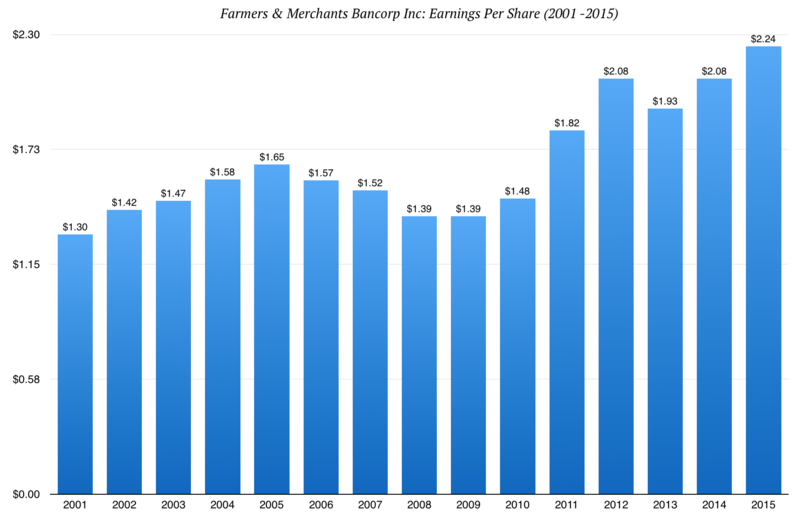 A couple of weeks ago I very briefly went over the tiny sub-$500m market cap bank stock with over fifty years of consecutive annual dividend growth: Farmers & Merchants Bancorp. In the opening of that piece I also mentioned that I’ve so far come across three such “Farmers & Merchants” regional banks, all with their own long and illustrious dividend histories going back to the pre-Depression era. Let’s go ahead and take a look at the second one, Famers & Merchants Bancorp Inc. (ticker code: FMAO), which is the holding company for a bank operating in Ohio and Indiana called The Farmers & Merchants State Bank. Now if you thought our first Farmers & Merchants stock out in Central California was small then consider this: The Farmers & Merchants State Bank is about a third the size of that. It’s an absolutely tiny company. According to MarketWatch the average trading volume is just 686 shares a day, equivalent to $20,580 in trades using the current stock price of about $30. I don’t know about you but the immediate image that conjures up in my head is one of risk. Let’s face it a lot of stocks that share those characteristics tend to be absolute value destroying junk. Check out the history of this company though. It was founded well over a century ago in 1897 as The Farmers & Merchants Bank to serve the needs of the town of Archibold, Ohio with its then population of about 900 people. It has changed its name just once to the current title, and that was a minor change that reflected the move from a private bank to one that was state chartered. The vault featured a time controlled money safe. The building and equipment were unique to the early 1900’s and adequately served the banking needs of the area for over 50 years with only minor interior alterations. That young bank had accumulated about $0.57m in assets by 1919. Today that figure is around the $1bn mark, with 23 offices and 37 ATMs across half a dozen counties in Northern Ohio plus a handful in Indiana. Oh, and get this, they have always paid a cash dividend over their entire history going back to 1897. This tiny bank with its $140m market capitalisation lands somewhere between General Mills and Colgate Palmolive on the dividend longevity scale. It has survived economic depressions, recessions, global conflicts and sweeping technological changes by providing the kind of boring banking services that are vital to a modern economy and which probably always will be. Operating primarily in Northern Ohio that has meant loans to the farming industry for things like land, livestock, farming equipment, fertilizer and food in addition to standard consumer and commercial lending. Let’s take a look at a fifteen year investment in the bank’s stock. Back in 2001 you’d be looking at this tiny regional bank having earned $7.4m in net income over the previous financial year. Undeterred by a tiny thinly traded stock with a then market cap of just $123m you consider it on merit; the company has a history of profitable enterprise and had paid a dividend in every single year since its founding over a century beforehand. On the basis of the previous year’s dividend you would have been looking at a yield of 1.5% with the stock trading at 1.75x book value. In other words it doesn’t look particularly cheap, but you decide to invest in any case. At this point you’d have probably been sourcing shares from private transactions due to how tightly they are held and the lack of a listing on a main stock exchange. You might not even know the company existed unless you lived in the local area. From the data provided by private transactions the average share price in the first quarter of 2001 was $23.75 after adjusting for the 4:1 stock split that took place in 2006. Let’s you get your hands on $50,000 worth of stock, equivalent to 2,105 split adjusted shares at the time. In that year the company reported income of $1.30 per share. By the end of fiscal year 2015 those annual earnings had risen to $2.24 per share at a compounded annual rate of 3.7%. The share price is currently trading at around $30.25, meaning the initial $50,000 investment capital would be worth just over $63,685 today. In addition the company has paid out $11.33 per share in cash dividends over that frame, including a juicy bumper payment of $1.35 per share paid out in the third quarter of 2003. The total return would therefore consist of $63,685 in stock today plus $23,850 in cumulative cash dividends for a total return of $87,535 (assuming dividends were not reinvested along the way). That works out to a rate of just 3.80% compounded annually. There’s a great lesson in value here. The total returns basically match the underlying earnings growth and look utterly uninspiring; a symptom of investing in a period of high valuation, a limited growth market and generally low interest rates. It is very tough for bank stocks to generate high returns for shareholders in this kind of interest rate environment and remain conservatively managed at the same time. Indeed most of your returns would have come from the cash dividends the company paid out to stockholders. The reality is that back in 2001 you were paying 1.75x book value to own the stock; today you’re only paying 1.1x book value with a 3% dividend yield on the cards for this financial year. In fact it really only got somewhat reasonably valued during the financial crisis. The shares just don’t tend to get very cheap because they’re so tightly held. If you were brave enough to invest at the end of 2007 you would’ve seen annual total returns of 9.5% to date whilst enjoying an investment in one of the select few banks that managed to increase their dividends throughout the worst years of the global financial crisis. It’s just that due to its tiny size the stock will barely ever get any recognition compared to the much larger banks, despite the quality of its operations.